The lid of this box has a design based on the basic tesselation twist. 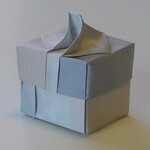 After forming the design using tesselation techniques the sheet was then treated as a normal square and folded into a basic box shape. The inside of the box. Note the underside of the tesselation type design. Top view of the outside of the box. A view which has been edited to show the basic creases better. Made from 2 pieces of American Letter-sized paper. This model uses "designer paper". Design could be modified for A4 paper without too much difficulty. The handle slot would be wider and the height a little lower. Handled box. The handle fits nicely in the hand and can be supported by a finger in the slot. Handled box. Side view. Shallow version. Handled box. Inside view. Shallow version. Handled box. Side view - deep version.